A retrospective of the life’s work of Damian Le Bas, complemented with works by Gabi Jimenez and Karol Radziszewski. 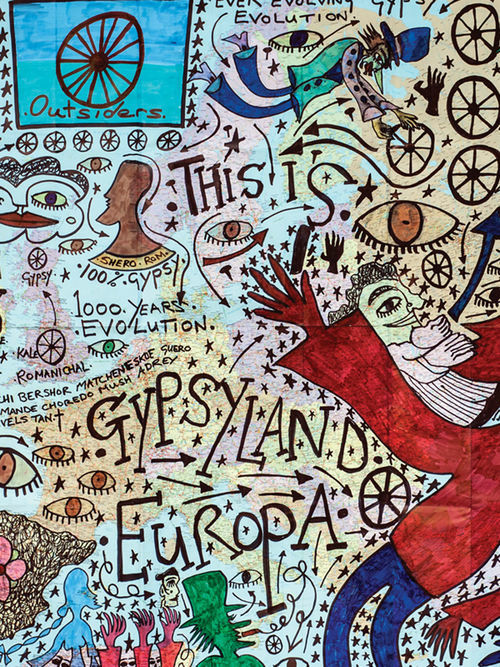 Damian Le Bas was one of the 16 artists who exhibited in the First Roma Pavilion Paradise Lost in Venice Biennale in 2007. He was a cross practice artist, he attended the Royal College of Art London 1985 to 1987. His work has been included in outsider art collections in various exhibitions since the late 1980’s. The works in this retrospective are reflective of different aspects of his artistic career including maps, in which he visually subverted ideas of boundaries and borders, Gypsy Dada, objects, sketch books and archive material from his studio as well as a selection of works made in collaboration with the artist Gabi Jimenez. The exhibition will be complemented by images along with Damian Le Bas’ tattoo drawings, a result of a photographic collaboration with Karol Radziszewski, started through the residency at Jaw Dikh! in Czarna Góra, Poland. 07 – 30 April 2018. Maxim Gorki Theater. Berlin.